Thomas Kyritsis was born and raised in Athens, Greece. After studying hospitality in his hometown and working for a number of prestigious establishments, Thomas moved to the UK where he gained a first-class honours degree in International Hotel Management from the University of West London in 2007. He immediately followed this by a Masters in Hospitality Management, gaining a Distinction. Shortly after completing his studies Thomas moved back to his home country, where he secured a role as Assistant Food and Beverage Manager in a large luxury hotel. After a year and a half, Thomas returned to London where he worked in operational roles for companies such as Hilton Worldwide, Doyle Collection, CCTvenues and Dorsett International. Thomas joined Le Cordon Bleu London teaching team in 2017. What is the role of a Food and Beverage manager? It is a very diverse role and you have to be highly organised as you deal with various operational and strategic aspects within the department. You need to plan, direct and control the department so as to have an efficient operation and meet your goals. Some of the responsibilities of the role would be to direct and evaluate the offering of the department, recruit, train and monitor the performance of their team, monitor the revenue and expenses of the department and ensure that the department complies with health and safety regulations. How was it to open a hotel as Food and Beverage manager? Opening a hotel as Food and Beverage manager was a challenging and fun journey. We started from scratch; literally an empty building following the construction work that over a number of weeks was turned into an operating business. I remember, there were days where big trucks would deliver furniture and equipment and as a team we would place these throughout the hotel. Organising recruitment open days prior to opening the hotel and training a completely new team who have never worked together before was also a great experience. Why did you decide to become a lecturer? The majority of my roles in the hospitality industry involved training and developing people’s skills. I always had a sense of satisfaction in seeing these people improving themselves and progressing in their careers. This has created my desire to pass the knowledge and experience I have gained in the industry to the students, and give students lenses so to speak with which to view the world and provide them with the skills they need to reach their potential and lead productive lives. The hospitality industry is a very diverse and vibrant industry that constantly evolves. What particularly interests you about teaching hospitality? The hospitality industry is a very diverse and vibrant industry that constantly evolves. The evolution of the industry over the years has exposed consumers to new concepts and services that are innovative. While working in hospitality, I have gained significant experience which allows me to transfer it to students so I can inspire them to learn about this exciting industry. What are the highlights in your career? What was your biggest challenge? I think there have been a few. Opening a hotel as a Food and Beverage Manager was an important step in my career and a great experience. In addition, I was part of the pre-opening team of a leading conference, meetings and training venue specialist where I set up the Food and Beverage offering in one of their Canary Wharf venues. All openings and launches of new concepts that I have been involved in the past had certain challenges prior to operating the business, which have been manageable. However, the biggest challenge of them all is the fact that I was studying (still studying currently) for my PhD qualification. What can you tell us about the Culinary Industry Management BBA launched in partnership with Birkbeck University? 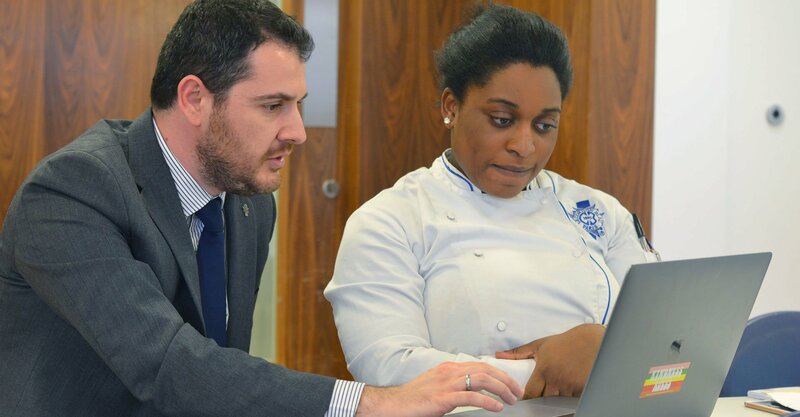 Both Le Cordon Bleu and Birkbeck have a tradition of providing high quality educational programmes to a diverse range of students and who are respected for their individual approaches. The degree has been developed with the aim of addressing the growth of the global food industry and the changing consumer needs. This has opened up a wide range of endless opportunities for innovation in food businesses and provided a highly competitive diverse marketplace. The programme addresses key concepts together with the project management and development skills required of managers in food businesses in the 21st century. Students will acquire a solid foundation in culinary skills and associated product knowledge, a global perspective of the food industry and an ability to assess the evolving needs of the marketplace. Students will also develop research and presentation skills together with their ability to design, develop and implement systems that assist in the successful operation of a food business. The programme is for students who want to pursue a career in areas such as: retail and new product development, restaurant development and operations, sales and marketing, corporate and employee catering, public and private healthcare, procurement or those who wish to wish to set up their own business. Please share 3 top tips students need in order to excel in the hospitality industry.